Notes: Home produced cover - unusual and maybe 'one-off' design. 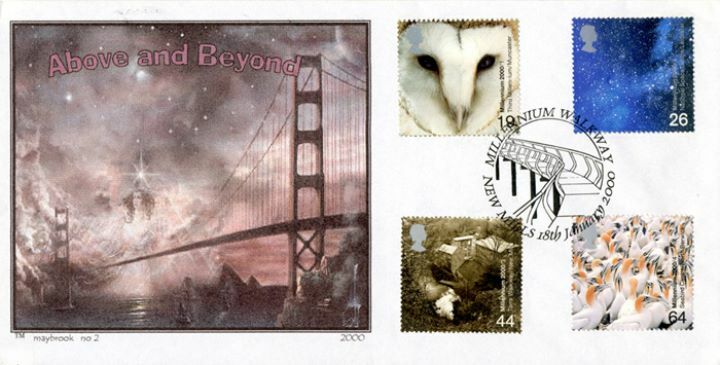 The above Royal Mail Above & Beyond stamps were issued on 18 January 2000 by Royal Mail and feature the following stamp designs: 19p Owl Centre; 26p Space Centre Leicester; 44p Torrs Walkway; 64p Seabird Centre Berwick. The Suspension Bridge first day cover with the New Mills, Millennium Walkway, Special Handstamp postmark and features these stamps which can make a very collectible and lovely gift.